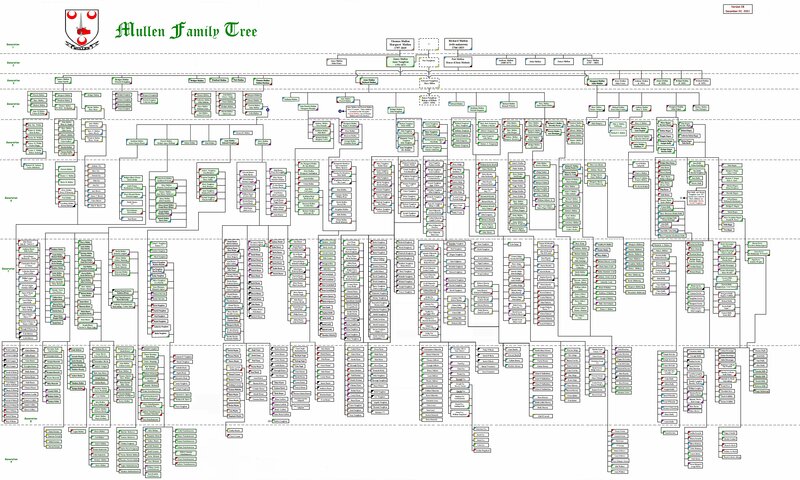 There's a new name on the Mullen Family Tree! On Saturday, September 26, Avril Gilmartin married Tony Leary. 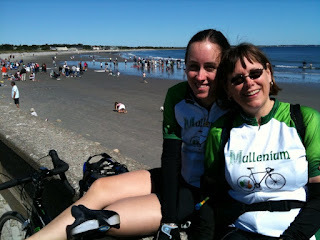 A few of you may have had the opportunity to talk with Avril and Tony at last year's Mullen Family Reunion in Ballina. They were unable to attend the Saturday banquet but made a brief appearance at the Frogs Piano Bar on Friday night. 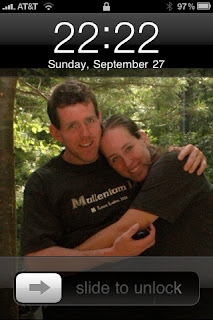 Luckily, Marilynn and I had the good fortune to spend an evening with them this summer during our vacation in London. Knowing how much we enjoyed just having dinner with them, I can only imagine how much fun their wedding was. 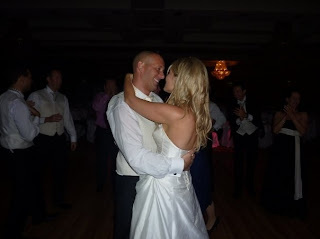 Below are a few pictures that I was able to snag off of Facebook, followed by a first-hand account of the wedding as reported by Ashling Gilmartin, Avril's sister. 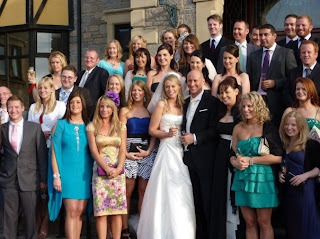 Ashling can be seen in the photo below on the left-hand side of Tony, her new brother-in-law. 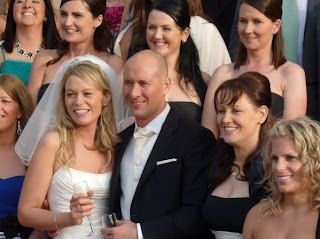 "Avril Gilmartin and Tony Leary were married on September 26, 2009 at Ballintubber Abbey (where Pierce Brosnan got married), followed by a reception at Knockranny House Hotel in Westport, County Mayo. The wedding was at one o'clock and Avril arrived at about ten past, which was the first time she was actually on time for something! The guests had to be ushered into the church in a hurry as Avril was held back at the end of the road until everyone was inside. Enda Lavin played the bagpipes from the end of the road up to church. The vintage car that brought Avril to the church is owned by our Uncle, Andrew Treacy. Avril had a special candle to light in memory of Dad, David and our Aunt Mary Foy (Dad's sister). 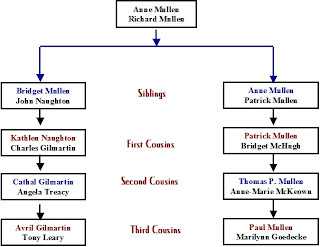 The Mullen family was represented by Auntie Kay Lynn, Uncle Stan Lynn, Charlie & Patricia Foy, Raymond & Eilish O Boyle, Noelie & Vicky Foy, and Jackie & Richard Myres. Enda played the bagpipes again as the car came to the hotel and he played her to the door and again into the meal, which was lovely. Avril and Tony had a champagne and strawberry reception when the guests landed and then once that was over we went in for the seven-course meal. Everything went off well on the day. The meal was lovely and the band and DJ were brilliant. 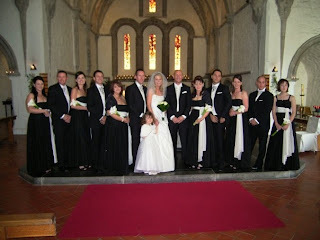 The wedding ended around three o'clock in the morning and the guests remained on until four and more until five. It was a fabulous day weather-wise and a great day was had by all." You might be 30 years old, but you'll always be 22! The Testostertones, an a capella men's choral group from Princeton High School were great, but their set was way too short. Here's a YouTube video which gives you some idea of their talent: http://www.youtube.com/watch?v=6ReiIRKITU0. Exit 8A (referring to the Cranbury Exit off of the NJ Turnpike) is a garage band composed of 15 and 16 year old Cranbury kids. What they lacked in polish they more than made up for with enthusiasm and budding musical skill. Their best moment was probably their cover of "Scar Tissue" by the Red Hot Chili Peppers. The next performer, Stephen Szczepanik, was described as a "classical acoustic guitarist". His talent was obvious but his overall performance was, perhaps, a tad laid back for the general Cranstock crowd that had come to hoot and holler. Selkow, a band containing 2 former Cranbury residents (Matt Foster and Mike Golisano), came on next. Their performance was excellent showing plenty of polish and skill. For the most part, they played original material, but they did an excellent job with three cover songs as well: "Who'll Stop the Rain" by Credence Clearwater Revival, "Rock the Casbah" by The Clash and "Time" by Pink Floyd. The last local group to perform was, without a doubt, the hit of the show: The Crandaddies, a cover group composed of local Cranbury fathers. Although I knew just about everyone in the band, I had no inkling of the skill level that they possessed. They started off with a bang, performing a cover of Bruce Springsteen's "Thunder Road" that was surprisingly good, from the opening harmonica to the closing saxophone solo. The musical abilities of everyone in the group was quite impressive, as were the vocals and overall stage presence of their lead singer. The only people enjoying The Crandaddies more than the crowd was The Crandaddies themselves. They were having a lot of fun, and it showed. The last band of the night -- and the feature band of the festival -- was a band from northern NJ called The Robert Murdock Band. They were billed as a British Invasion tribute band but, after 5 hours of Cranstock, Marilynn, Hannah and I had had enough. And since The Crandaddies had just closed their set with a great rendition of "Sympathy for the Devil" by The Rolling Stones, we had already seen our British Invasion tribute band for the evening. All in all, it was an excellent event. 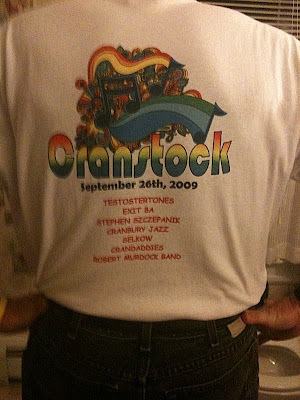 Here's hoping that there's a Cranstock 2010! I'll try to add a photo of the event later on tonight. The Lasting Importance of Obama's "School Speech"
The real importance of Obama's speech to school children yesterday had nothing to do with what the President actually said. Not that his speech wasn't full of worthy ideas (click here for the full text). No, the true value of the speech lies in the events that preceded it. Obviously, not everyone in America is an Obama supporter. There are plenty of Americans with real (and sometimes valid) differences with Obama’s ideas and the direction that the Democratic Party wants to take America. Unfortunately, too many “voices” associated with the Republican Party are clearly in the lunatic fringe. The challenge that the public has is to differentiate the rational pundit from the lunatic. Well, thanks to the President’s innocuous act of addressing the nation's school children, we now have a clear litmus test. Even after the speech, Rush Limbaugh was still foaming at the mouth, saying that the "original intent of the speech was a dear leader kind of thing," that was "right out of the pages of Kim Jong Il." An audio of his comments can be found here. While he now says that there was nothing wrong with the speech, listen to this audio of Beck’s comments leading up to the speech. For some inexplicable reason, he also trashes teachers as well! The Internet carried the following assessment of Will’s position, saying that he was “the rare pundit who faulted the White House in this furor. He said it's not the federal government's job to raise children and blasted the administration's approach to public relations. The president is ubiquitous in the media, Will said, and has become like elevator music.” While I don’t necessarily agree with Will on this, at least he presents a rational and reasoned critique. Monica Crowley has a syndicated radio show and is a regular commentator on The McLaughlin Group and Fox News. She also holds a Ph.D. in International Relations from Columbia University. Her analysis: "Just when you think this administration can't get any more surreal and Orwellian, here they come to indoctrinate our kids." “Just read President Obamas speech to students. ... It is a good speech and will be good for students to hear." A few days before the speech, Senator Russell was quoted by the Associated Press as saying, "As far as I am concerned, this is not civics education — it gives the appearance of creating a cult of personality … This is something you'd expect to see in North Korea or in Saddam Hussein's Iraq." I could go on and on, but I think you get the point. So, the next time that you're discussing politics with someone, bring up Obama's School Speech and get their opinion. You might as well do this right off the bat and determine whether a rational discussion is even possible. After eating, we went outside for a little tour of the Holy Redeemer grounds. There is a great little water fountain (two children, one holding an umbrella), some beautiful flowers and quite a few unusual trees (Tulip Tree?). Afterwards, we sat outside on the front porch and talked a little bit about the Notarfrancesco family. I learned (for the first time), that Uncle Nick's father (named Joseph) grew up in an orphanage in Italy before coming to America. Per Aunt Mary, the orphanage was run by the Franciscans, which had something to do with the ultimate creation of the family name, Notarfrancesco. I'm not exactly sure how the surname was derived and Aunt Mary did have a slight twinkle in her eye, so she might have been pulling my leg. Like a good reporter, though, I just relate what I'm told! At one point, I tried to take a quick iPhone video of Aunt Mary relating a family story or two. As shown in the brief video below, though, I didn't get very far. 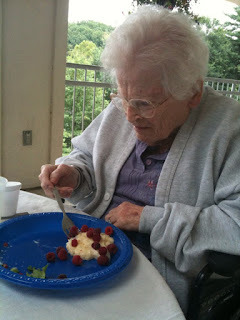 I had just gotten her rolling on a story when she heard Marilynn knocking at the veranda door. Marilynn had gotten a little chilly out on the veranda and was fetching a sweater of Aunt Mary's to wear. Not that great a video, I know, but it gives you some idea of what our conversations were like. I tried to record some other videos a couple of times after that, but the audio quality was very poor, especially when we went outside.